Make your own tofu at home! Teaching yourself how to make raw tofu can be surprisingly beneficial for a number of reasons. If you're in it for health purposes, you can enjoy a variety of fresh, new dishes regularly. If a friend or family member is a tofu devotee, you can surprise the person with a home-prepared meal. Before making it, it's important to understand a bit more about tofu than just the mere fact that it's a wobbly, white block. 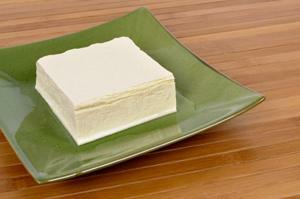 Tofu is a fragile food made from soybean milk curds. It is recognized for its nutritious qualities and is especially rich in protein. Though it is a popular addition to Chinese meals, it is highly versatile and is regularly used in other cultural cuisines as well. Tofu is available in various varieties and textures, including firm, extra-firm and soft. Most tofu available at supermarkets and grocery stores has been heated. According to people who follow a raw food diet, this destroys vital and life-giving enzymes. Raw tofu, on the other hand, is made by curdling soymilk with salts, draining and pressing it. It can be time consuming. If you can find raw food tofu at the store, it may be easier and more economical to purchase it. You can make raw tofu at home. Purchase raw soy milk at health food stores. The rest of the equipment and ingredients needed to make raw tofu may be found at the average grocery store, supermarket or health food store. Place the Epsom salts into the gallon of soy milk and stir gently for a few minutes to ensure they are dissolved. Set the container aside for at least a half hour. Begin checking the soy milk after the first half hour. The Epson salts should curdle the soy milk. Once curds form, you are ready to make tofu. Place the cheese cloth over the bowl, and slowly pour the curdled soy milk onto the cheese cloth. Take the ends of the cheese cloth and pull them up to make a bag filled with liquid and curds. You can either begin squeezing the liquid out now, or use the masking tape to close the bag at the top to make it easier to handle.Now with gentle pressure, begin squeezing the bag. You must drain off as much liquid as possible. Continue squeezing until very little liquid comes out of the bag and you are left with a cheese cloth filled with soy milk curds. Place the firm curds into the mesh strainer and cover with another piece of cheese cloth. Place the weights on top and let it stand for a while to further drain off any liquid. When you're sure you've drained off as much liquid as possible, place the raw soy milk curds into the container to mold and shape it. Make sure you cover it tightly with a lid. Use raw soy milk tofu within a day or two and discard if it smells or looks at all questionable. Unless you're a huge fan of tofu, making raw soy milk tofu may not be worth the time and trouble. You can easily obtain your calcium and protein requirements from raw food sources, such as green leafy vegetables which are replete with calcium and vital minerals, or nuts and seeds, which are excellent sources of protein. Raw soy tofu, however, can be the perfect base for delectable raw chocolate mouse, raw food cheesecake, and other scrumptious raw, vegan desserts. Excessive consumption of raw soybean proteins has been shown to be toxic in animals such as chickens (chicks) and rats. The Eden Foods website contains a fair and balanced look at soy and the various controversies surrounding it. Various websites report conflicting advice - eat raw soybeans, don't eat raw soybeans. According to Dr.William Harris, M.D., raw soybeans contain compounds that can cause digestive upset. Most websites recommend cooking soybeans. The decision to eat raw soy or raw tofu is up to you, but eat it sparingly if at all.